Albondigas, are Spanish-style meatballs. These are perfect to enjoy has an appetizer, or to serve for dinner. In case you were wondering, albóndigas is a Spanish word that means meatballs. 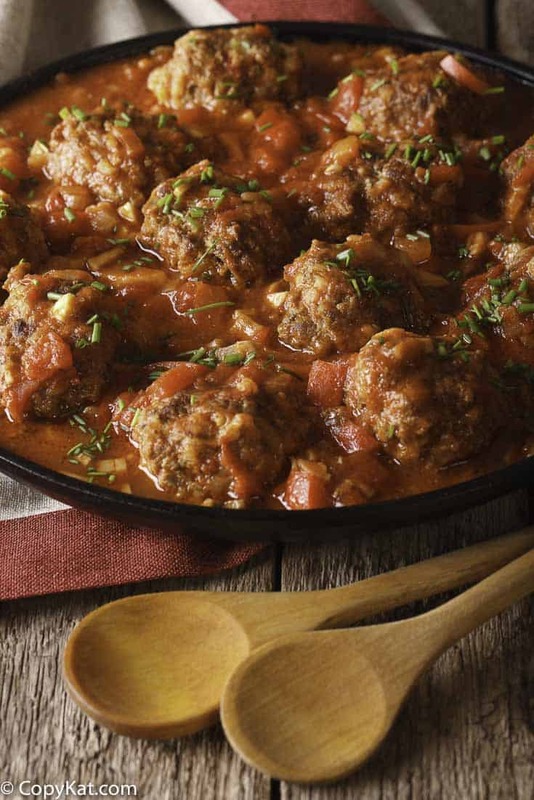 These Spanish-style meatballs have a wonderful complex flavor and are perfect to enjoy as an appetizer – or to serve as a delicious main dish for dinner with some crusty bread for sopping up the savory tomato sauce – you won’t want to miss a drop. If you want to serve them as an appetizer, provide toothpicks or cocktail picks and plenty of napkins alongside. It turns out that Albóndigas were originally introduced to the Spanish world from the Middle East during the Islamic rule of the Iberian Peninsula which lasted from 711 AD until 1492 when the Moors were expelled from Spain. The word “al” in Arabic translates to the English word “the.” The word “albóndigas” is very likely some permutation of “al-bunduq,” which means “hazelnut,” and describes the meatball’s size and shape as being like that of a hazelnut. Several cultures have tweaked the recipe just a little bit. While half pork and half beef gives these tasty meatballs a soft texture, many of the original recipes for albóndigas use lamb, rice, and mint. Albóndigas are widely eaten in Spain, Mexico, and other Latin American countries. They are generally made from ground beef, but they may also be made from veal, pork, poultry, and sometimes even fish. 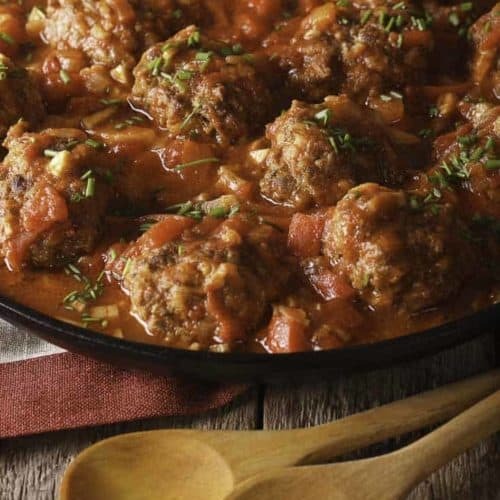 Because this meatball originated with the Moors, you will usually find some exotic spices in recipes originating from the Andalucia region of Spain where the Moors had the most influence. Tapas are Spanish appetizers that are served together to make a wonderful meal. Lots of little dishes mean you get to sample many different flavors. According to legend, tapas originated in Spain, when King Alfonso 10th came down with a serious illness and he was only able to take in small portions of food at a time along with little sips of wine. There are also other tapas origin stories which you can read about here. These Spanish-inspired meatballs are so good! Don’t let the number of different ingredients put you off – this recipe is not hard to make and it tastes delicious. Just remember to use a light hand when forming the meatballs, just as you would when shaping a hamburger patty, to ensure light, tender results. 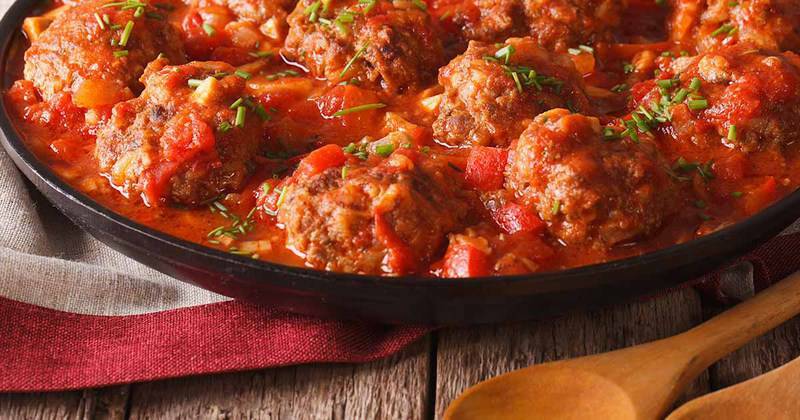 Enjoy these Spanish inspired meatballs. For the meatballs In a bowl, mix together all the ingredients (not the olive oil) until you have a nice stiff consistency. Cover and leave in the fridge for about half an hour. When ready, make your meatballs, taking about a tablespoon of mixture for each one. Heat about a tablespoon of oil in a frying pan and fry the meatballs in batches on a med-high heat. You want them nicely browned. Add more oil if necessary for each batch. Drain on some paper towels and keep warm. Use the same frying pan (but tip out any excess fat) to make use of the lovely meat juices that should have caramelized on the bottom. Add the oil if necessary and cook the onion until soft and translucent, then add the garlic, a few grinds of black pepper and cook for another minute or so. Make sure you don’t burn the garlic as it will taste bitter. Add the wine and increase the heat to high, let the wine boil for a minute or so to intensify the flavor. Add the can of tomatoes, the puree and the stock. Bring back to a boil then simmer for about 10 minutes. Add the peas, stir in the cayenne pepper and the meatballs and continue simmering for another 10 minutes. Serve it up, piping hot, straight from the pan with plenty of crusty bread to mop up the sauce. I am so happy you enjoyed them! This was so good! My husband and nephew loved it. My daughter and I liked it as well but not as much as the guys! Definitley serve with plenty of fresh bread.